Morsky Svet which translates as Sea World in English is located on the right hand-side of the main entrance to the expansive ‘Vystaviste’, or exhibition grounds in Holesovice, Prague 7. 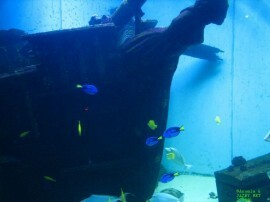 It prides itself on being the largest aquarium in the Czech Republic and attracts more than 80 000 visitors per year. The massive jaw of a great-white fiberglass shark decorates the side of the aquarium and is also suspended above the main entrance door to the site itself. Having first opened its doors 6 years ago, the aquarium is spread over an area of 1000m2 and holds over 240 000 literes of specially produced sea water. 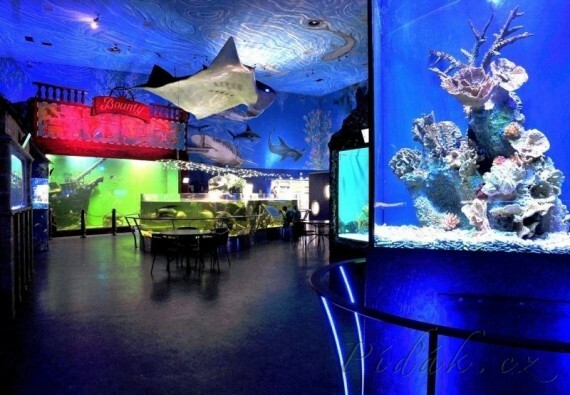 More than 50 separate fish tanks house over 350 varieties of both fresh and salt water fish and in addition to this, there is a total of more than 4500 different types of sea and fresh water creatures. The initial impression upon entering the aquarium is that its a little bit cramped but once one passes the cash-desk and mini souvenir shop this sensation goes away. The sight of a huge water tank with a replica of the shipwreck ‘The Bounty’ on one side and the newly opened giant see-through fresh water tank on the other is impressive. 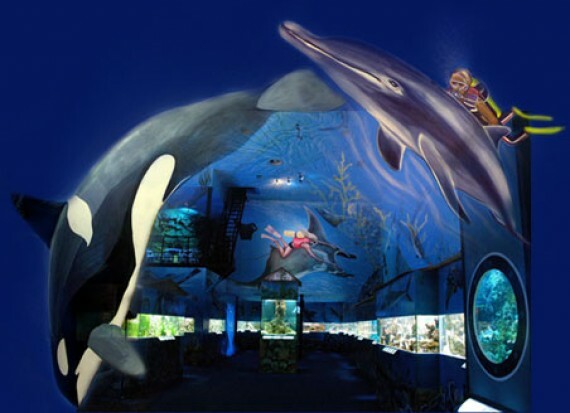 The room is darkened and the high ceilings are covered with paintings of various fish and scenes from the sea which immediately evoke the feeling of being under the ocean. This sensation is further enhanced by the soothing sound of breaking waves and accompanying noises from the deep. Walking around the large room, one can view fish tanks (commentaries in Czech only) of varying sizes with many different types of colorful tropical fish. There are fish from the Atlantic Ocean, fresh water fish, stingrays, jellyfish, lobsters, barracudas and various species of shark. 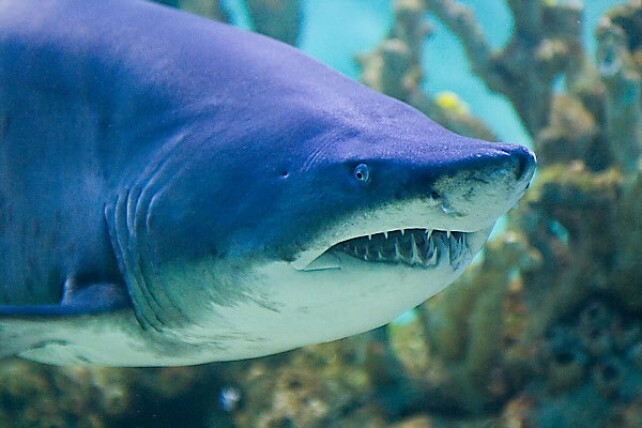 The most noted of the shark species is the sand shark, which measures over 2 metres, and is the largest live shark in the Czech Republic. 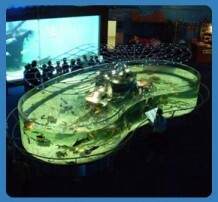 The recently unveiled gigantic see-through open tank mainly contains various species of fish and turtles originating from South America. 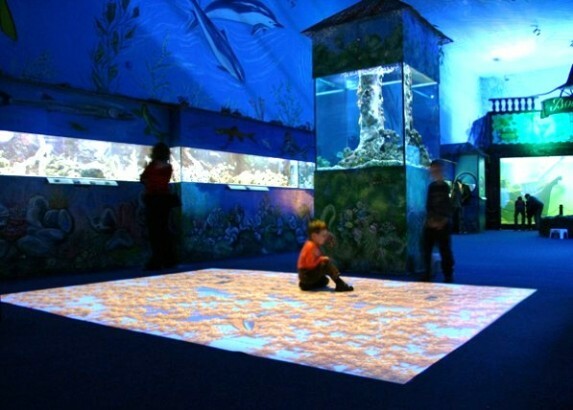 Bright blue lights illuminate the steps to the smaller but cosier second floor of the aquarium. Here one finds a 25-metre long artificial coral cave, containing about 10 additional fish tanks, with sea creatures typically found living around coral reefs. The so-called ‘Space Lagoon’ on this floor is also a recent addition. This exhibit (built by the artist and psychologist, Zdenek Hajny), has been set up to symbolically demonstrate the connection between the sea, space and the human soul. A screen displaying shots taken by NASA’s Hubble space station is surrounded by a fish pool made out of amethysts and crystals. Visitors are given the chance to sit in this ‘relaxation area’ while renewing their spiritual levels (a bit challenging when accompanied by a 3-year-old monkey!). For 3-year-old Albie, the most interesting part of the aquarium was seeing the sharks and chasing and jumping around on the images of fish moving around on a big (about 5mx3m) screen on the floor. Morsky Svet call this the ‘Pool System’, which is essentially an interactive projection system that reacts to human movement. All the fish always got away when Albie tried to step on them or chase them away. The great sound effects added to the fun for all the children (and adults) who stepped on this screen. The overall impression of the Czech Republic’s largest offering of what lies beneath the surface of the ocean is rather small and modest. Morsky Svet has tried hard to make the best of what it has to offer. 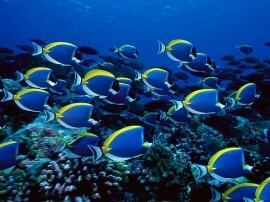 The fish tanks are spotless, the water crystal clear and all the fish and other species are held in perfect condition. A special filter system has been installed to treat 60 000 liters of water in just 1 hour and natural sunshine and moonlight are simulated by an artificial light system. Companies can organize various functions and conferences here, and there is also an animal sponsorship program on offer. Reduced ticket rates are available for employers (minimum of 20), and are fully tax deductible. The shop offers an extensive variety of merchandise from T-shirts to pens and coins. There are also 45-minute guided tours (in Czech only), which need to be booked in advance (Tel: 220 103 275) and are given every day until 3pm. Adults (and some children), might find Morsky Svet slightly limiting but on a cold and wet day it is a pleasant way to spend some time indoors. NB: The recent fire which destroyed a large part of the left wing of the exhibition centre has luckily left Morsky Svet unscathed and it remains open as usual. DIRECTIONS: Metro C (red line) to Nadrazi Holesovice and then by tram 5,12,14,15, or 17. Get off at tram stop ‘Vystaviste’. Veer towards the right from the main entrance to the exhibition grounds (about 500m from the tram stop). Paid parking (CZK 40 per hour is available in front of O2 Sports Stadium). Only a fence (which one needs to walk around), separates the parking area from Morsky Svet itself. Discounted tickets are available for larger families or groups of adults.